It has been a few years now of companies venturing into the social media marketing space by way of different online channels. The past few years have been a huge transition by individuals and companies from utilizing traditional marketing almost exclusively, to venturing into the online marketing space. This transition has been filled with growing pains i’m sure and although the transition has not been seamless, it is progressing. At one time It seemed as if companies just didn’t get it, that they really didn’t understand the importance of the online presence. The transition from what was once was exlusively traditional marketing to mostly digital and now a bit of a fusion between the two is lending itself to a willingness by organizations, to embrace this new era of marketing. Two years ago there was a huge avenue for people to present themselves as SOCIAL MEDIA GURUS to the unsuspecting organization that felt a bit of urgency to run head first into the online marketing space. Now that some have done that and are experiencing it, they are now realizing that working with a Social Media Guru is just not enough. This is primarily because it’s NOT just about social media, it is about Digital Marketing which is a much more diverse combination of Internet strategies. Exclusively utilizing JUST social media is like using only print catalogs in traditional marketing, it is just NOT enough. This is the same philosophy that has to be embraced when thinking of Digital Marketing, utilizing JUST social media is just not enough. 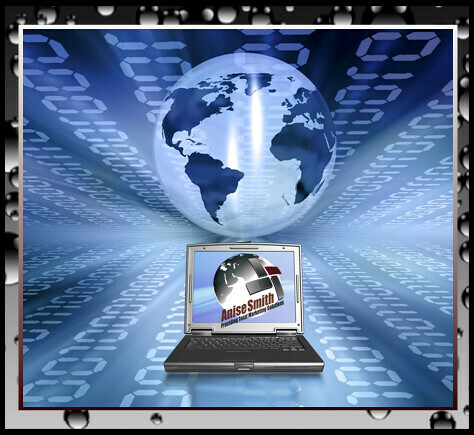 At one time it was ok to utilize some traditional marketing and have a website. Now a fusion of those strategies mixed with social media is making way for the Digital Marketer, which utilizes a combination of these strategies and more to create a total online /offline fusion that will move brands beyond the single dimension of just traditional marketing or just social media. In 2013 the Digital Marketer will be more in demand that ever, because progressive companies have realized the importance of having marketers that skill sets embrace all digital strategies not just certain aspects of an online presence. Some tradition web design purist haven’t embraced social media integration and are stuck in what they have learned in a traditional sense. Additionally some social media gurus have not moved past just posting information to social media channels. However, there are some web designers and social media marketers that HAVE embraced both and those are the Digital Marketer that will be in demand in 2013 and beyond. 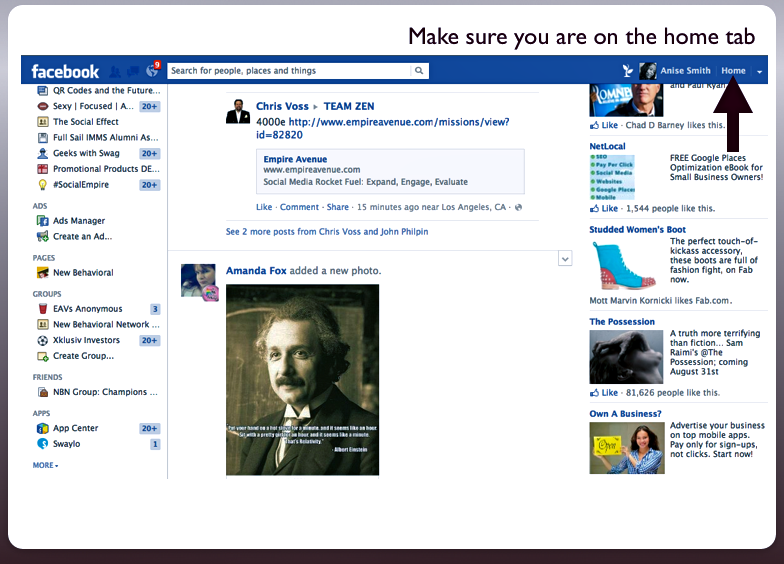 Tagging 100+ people on Facebook everyday to boost your Klout score. Your employer, client and or potential client/employer probably could give a rats you know what about your score. Most employers or clients don’t even know what Klout is or what is involved with the scoring process. Do you even know? Connecting to random influencers and NOT becoming an influencer yourself. Your influencer is an influencer for a reason. You will make out better trying to analyze what they are doing right and emulate them. Posting 1000 pictures every day of random things. Although these photos may be beautiful, if this is ALL you do, how can that contribute to the value of your potential employer, client or customer? Or put you in a position to gain customers, clients or find employment in the Digital Marketing Space? The goal in this increasingly savvy digital marketing space, should be to provide services of value to potential and current employers and clients to increase their brand exposure, place them in a position to interact with THEIR current clients/potential clients and increase their chances of increasing revenue. This will involve YOU doing NONE of the above bulleted points but WILL involve you creating custom strategies for potential employers and clients in which to accomplish these goals. The lack of ability to do this WILL separate the Gurus from the Digital Marketers, that are really on their game. As we move forward in the Digital Marketing space we have to be willing to continue to grow and embrace new technologies that provide added value to clients, potential clients and employers. It has been an amazing few years in this space that is continuing to grow at an amazing rate of speed. 2013 will be the the year of many exciting changes to the people that are on their Digital Marketing game and challenges to those that are not on their game. Either way, get ready because I have a feeling its going to be a helluva ride! If you have comments, good, bad, ugly or indifferent I can be contacted by subscribing to my Facebook public updates or finding me on Twitter! I shall see you soon, I’m sure! Who is REALLY a social media expert? Last weekend I was having a bit of a technical issue with my router and it’s failure to communicate effectively with my modem. This created a HUGE issue with my need to communicate by way of social media. Not that I was having a social media withdrawal issue or anything but I did replace it with one of the ubee routers that I have been researching. However, take a look at the infographic below which displays how many other people may be having a social media issues. We are living in a increasingly social world and I am pretty sure that it will become more social as time passes, if you can even imagine that. As we grow accustomed to a different way of conducting “conversations” and sharing content we must be very aware of how and what we share, this is especially true if you are not self employed. I am a total advocate of freedom of speech, freedom of expression and all of the other freedoms we are allow by because we are American Citizens. I love to see great content, even controversial content especially when it is beautiful and or thought provoking. However I have had some things come through my news feed that makes me question the sanity of the people that are posting. For example I had a full upclose and personal blow by blow image gallery of c-section photos. Ummm Seriously? I want to see this? Why? Wouldn’t a person think about how they would feel if they got an a up close and personal of someone’s C-section in their news feed. One would think that the persons posting would come to the conclusion that people may not want that much information about them or may it could be that this may come under the over-sharing category. People should think about this BEFORE they hit the dang share button. Hmm imagine that, think before you post? I, do so wish that this had been the case with my c-section over-sharing friend, my cornea is still scorched and its been about two years since that traumatic experience. Ironically the same person that shared her C-section photos had the audacity to complain that Facebook was violated her privacy. Umm wow, really? 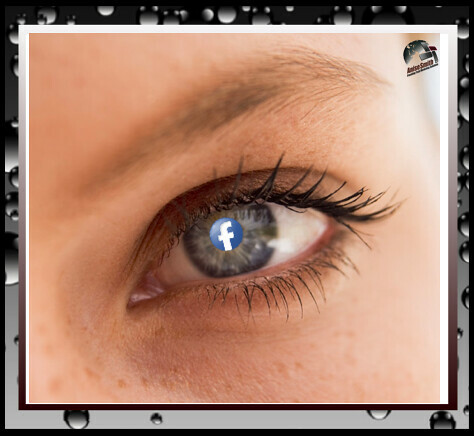 I think that Facebook MIGHT have had an opportunity to violate your privacy had you not beat them to the punch with the full frontal cornea burning images first. My point here is that although we are living in a social world some personal photos and such go way beyond oversharing and there needs to be an exercise in restraint. With that said I would never report a person based on their sharing. I recently experienced a friend that was reported and banned and I believe that to be excessive when I can just as easy move on to the next piece of content. Sharing with lack of restraint is really unnecessary because you can share only the information that you’d like by utilizing Facebook privacy settings. I find that in addition to the abundance of over sharing people really lack the ability , or chose not to to set up lists. This is the simplest way to provide content to certain lists of people and not to others. 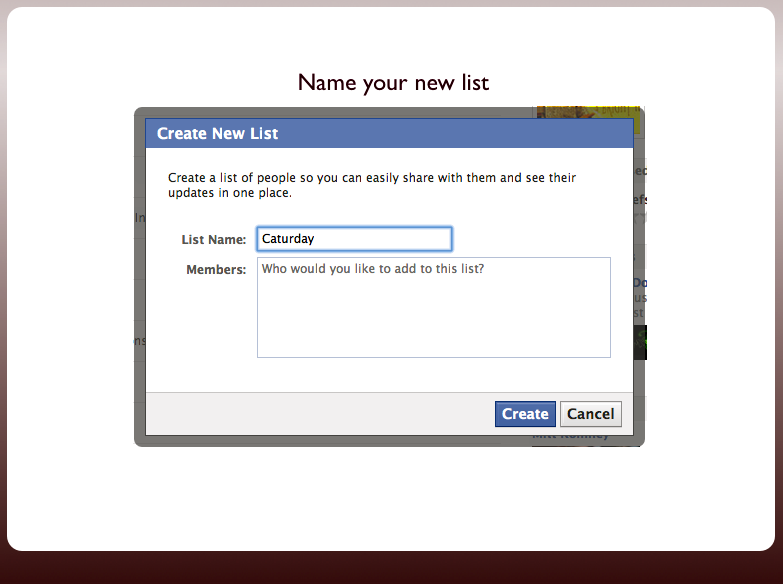 Facebook has always had the ability to set up lists to gear your content toward certain people on those lists. I wrote an ebook about this at least two years ago. This option was tweaked a bit and made easier after Google+ was introduced with their fancy circles which almost force you to be aware of who you share content with. Lists would have allowed c-section overshare abuser to share her photos with just the people she wanted to, instead of her entire friends list. This would have spared me the trauma of a scorched cornea as well. I have a super quick video below that will aid you so won’t, too, be guilty of affecting the vision of some poor unsuspecting soul. I have a list of friends, family, acquaintances, co-workers and subscribers on my Facebook page and I gear my content to different people by using lists that I’ve created. However even though I have lists, I am very cognizant of the information that I share. I only share information that I would share with my grandmother, father and or son. Since my father and son are both friends with me on Facebook this rule is easy to remember. If you question what you should or should not post, take a look at the infographic below to give some guidance. Just a short while ago it was considered taboo for people to be frolicking about socializing, chatting, engaging, liking and poking the many people on their Facebook pages. 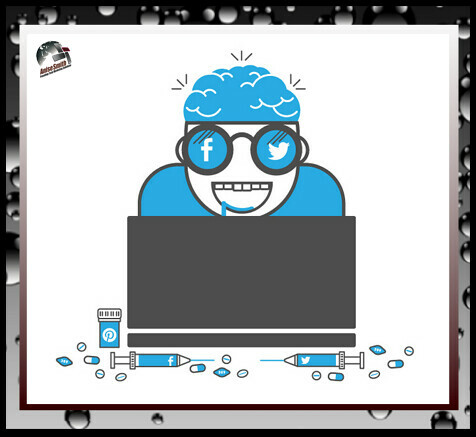 Employers were caught off guard and people were unprepared and not equipped to handle the growing Facebook/Social Media phenomenon. Employers are rebounding, implementing social media usage and policies into their organizational structure and realizing that social media can be a huge part of their digital marketing strategy. Employers are not shying away from social media as they were in the initial phases of the social media revolution. Employers are now realizing the benefits of having the ability to check out their future employers by way of social media channels before they invest any time in them as a potential candidates. They are starting to realize that Facebook with over 900 million users is the norm for communication for so many. It is also now recognize that socializing by way of social media is such the norm that not to do so could even be considered abnormal. Some are going so far as saying that the people that have an absence of Facebook profile could be psychopaths. I think that is a rather strong statement because I know a few perfectly normal people that chose not to be a part of the Facebook revoloution due to their need to have a private life and not share every detail of their lives. That is totally understandable. Maybe we should all question why we WANT to share so much. LOL However that is another post all together, which may come under the Social Media people are narcissistic category. The philosophy that there is something abnormal about people that are NOT involved with social media is being applied not only in the workplace and employers but to personal relationships as well. Some even suggest that if a person choses not have a Facebook page we should be wary about dating that person because they are suspicious and could have something to hide. Again, I am not so sure about that and I find that sometimes it’s just not that black and white. Employers are now taking a new found respect for social media and using it not only to find applicants in a recruiting sence but also using it as a way to red flag people that could potentially NOT be such a great fit for an organization. This is an amazing use of social media and could prove to be very beneficial to many organizations. We have come a long way baby, is all I have to say! So, since this is now the NORM it is beyond time to make sure you are on point with your online presence. 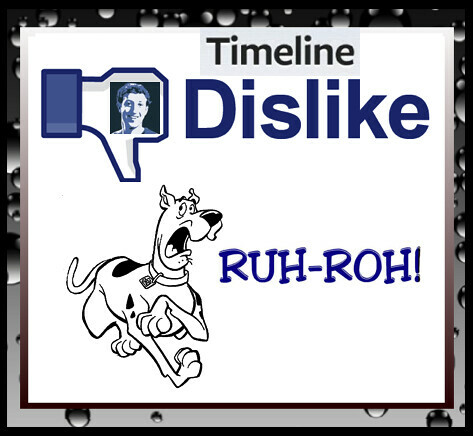 Yes, time to clean up that Facebook page. The key to starting with this project is to really allocate some time to getting this done properly. I was a strong advocate of setting and fully utilizing privacy settings as soon as I started my social media Facebook journey. 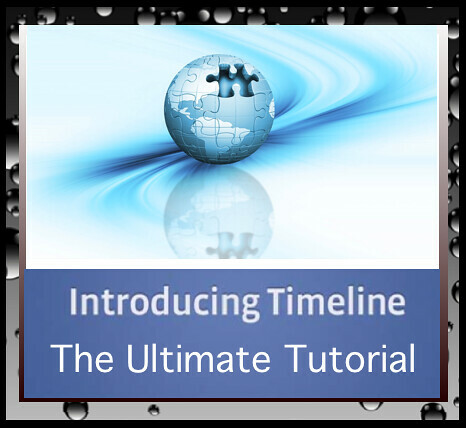 I actually wrote and ebook about it but due to so many of the revision to Facebook the ebook is a bit obsolete although the basic principles remain the same. 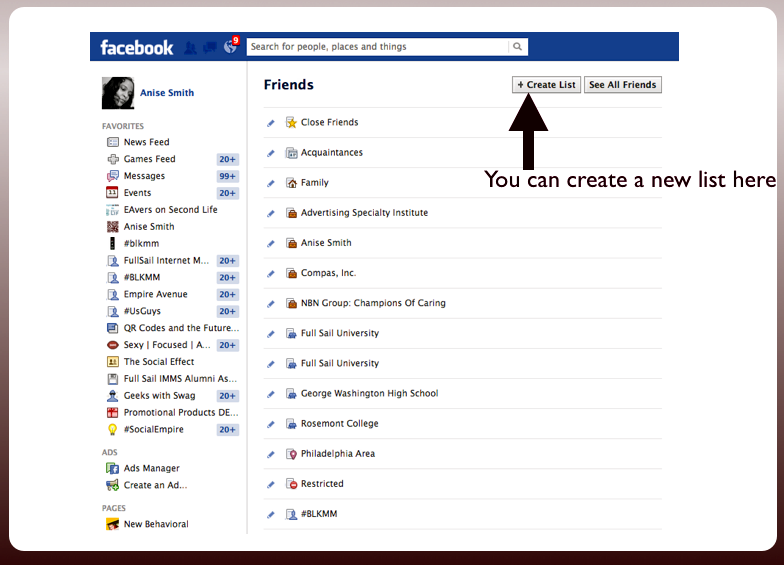 The first step is to set up Facebook Lists, this will allow you to share all of your status updates with who you want to, and exclude others. For instance if you are friends with people at work, they may not want to see a picture of your crazy Uncle Buck playing Beer Pong in his boxers, however your family may love it. So if you create a list for Family members that think Uncle Buck is a laugh riot you would be able to share that JUST with them and not everyone on your friends list. Second step is to share some information that is funny or positive to the public. This allows this content to be viewed by your public or people that have subscribed to your public updates. This is great information that you could use to give people a view of who you are. So remember to share great content, things that make people laugh or that touches their heart. 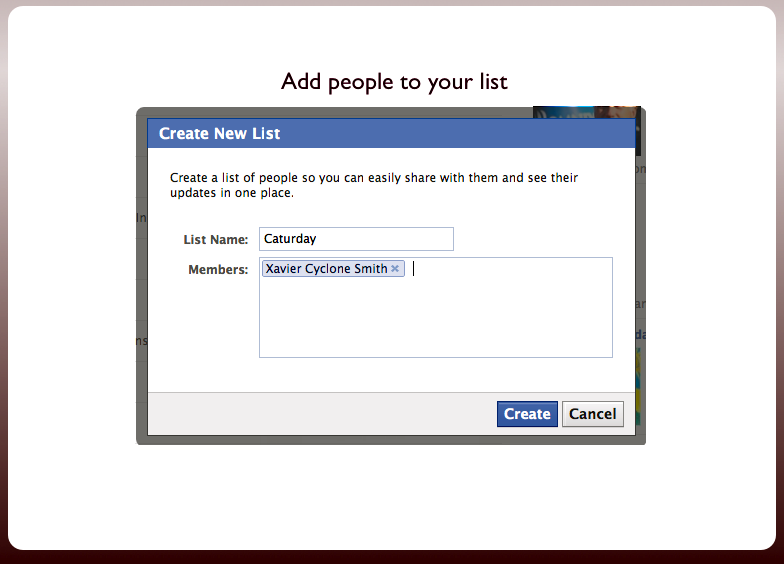 You can do this by creating a status and posting it only to the Public list using the drop down menu at the status area where you will be posting. 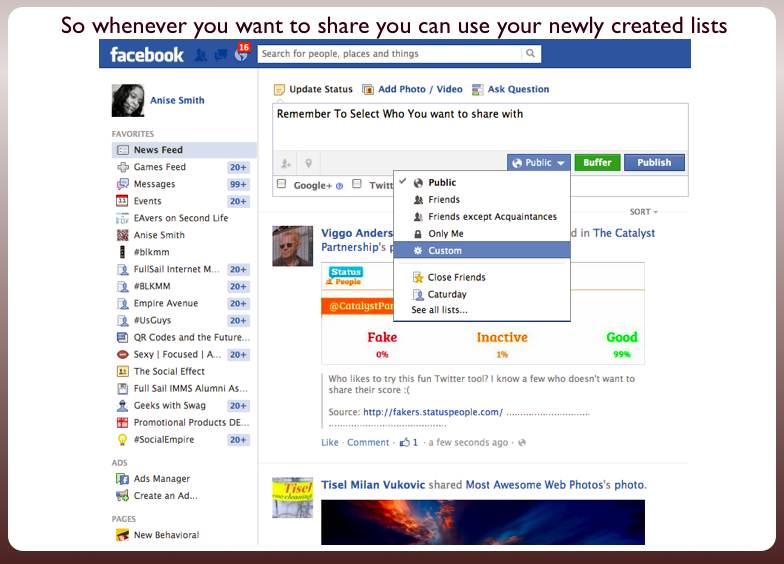 Third Step is to remember to share the information with the appropriate audience when you post a status update. 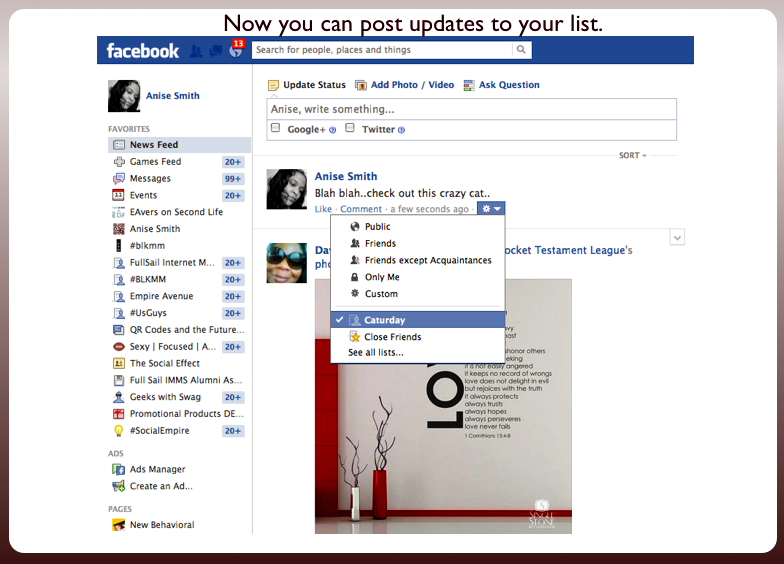 It is very easy to forget when you are posting to your status to allocate the right list. The good thing is that if you forget to post to a particular list or if you are unsure you can always go back to that post and change it. Take a look at the short video below that will give you a visual of how to get this done quickly! Ok, stop reading and viewing the video and get to work. Social Media has presented us all with the opportunity to engage, share and increase dialogue with many people. The super quick growth of social media has also opened the door to much more with how employers are dealing with social media, individuals, privacy issues, over sharing and much more. YES, I said it OVER SHARING! 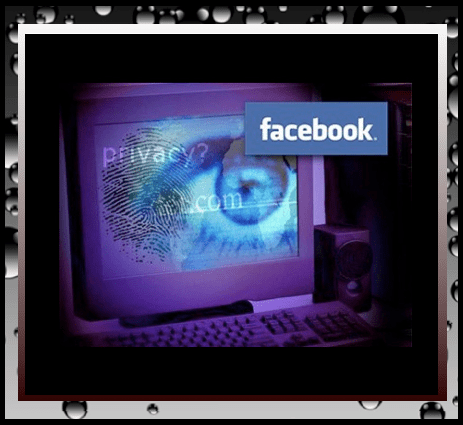 I hear so much about Privacy this and privacy that, oh my god Facebook is Invading my privacy again, blah, blah, blah-blah BLAH! Firstly, there is no such thing as privacy as we’ve known it, we are not living in the 80’s. If that is what you are looking for you could very easily just quit all of your social media channels and then simply turn OFF your computer. However we all know that is not going to happen. The third thing that a person could do to make sure their privacy has not been compromised by social media channels, is to STOP OVER SHARING. Yes, I said it AGAIN. I noticed that the people that yell the loudest about their privacy being invaded by Facebook and various other social media channels are the ones that are the most guilty of over sharing. There are just some things that need to remain private and I am not talking about funny little antics that have taken place during a persons day that others will find funny and uplifting. I am talking about some the the disturbing things that people share by way of status update that we just do not want to look at, hear about or would ever want permanaently branded into our brains. Before you post anything online ask yourself if you’d like to see what you plan to share floating through your newsfeed. We do not want to see what your cat ate and then expelled from its body. We do not want to see a video of your c-section, minute for minute and in its entirety. I had a c-section and I didn’t want to be in the room to watch my own procedure. 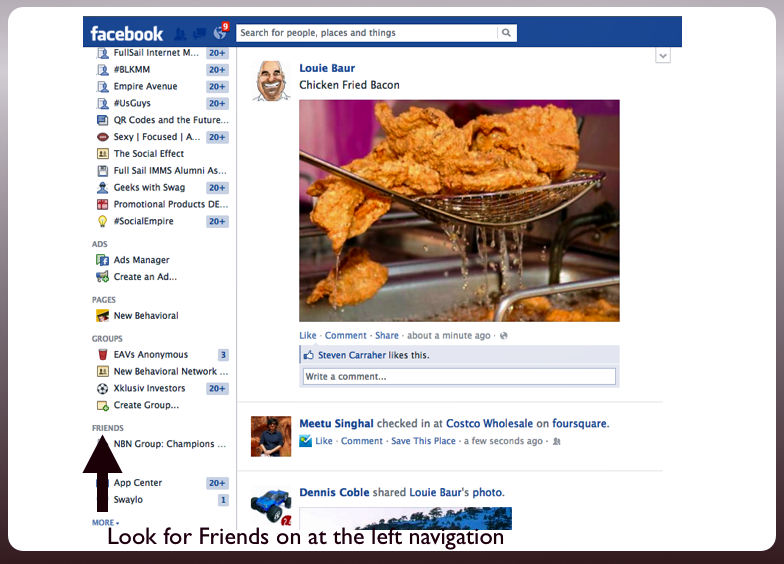 Seriously, this is NOT Facebook newsfeed going viral sort of content. We do not want to hear about hurling, burping, pooping, farting, scratching and most importantly we don’t want pictures either. I say all of this to make the point that privacy starts with you and your ability to have an awareness about what information that you select to share. If you do not post out of bounds pics, say inappropriate things, share distasteful video you limit the chances of this information coming back to bite you. As we move ahead with social media and social sharing we should utilize the privacy options that all social media platforms have in place. However most importantly we MUST develop an awareness about the information that we share. The golden sharing rule that I abide by is, I only post something that I would not be ashamed to show my father, son or grandmother. The take away: Think before you share and share responsibly!